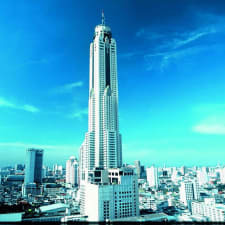 Baiyoke Sky is the tallest hotel in Thailand and one of the five tallest hotels in Southeast Asia. The property boasts a rooftop bar on the 83rd story and there is a seafood buffet restaurant on the 82nd story. Accommodations at Baiyoke Sky are equipped with floor to ceiling windows giving guests unmatched views of Bangkok. Rooms also feature free Wi-Fi, a flat-screen TV with cable channels, an en-suite bathroom with complimentary toiletries and a minibar. There is a shuttle service provided by the hotel that stops at a number of nearby destinations. Guests can also visit the observation deck or head to the outdoor swimming pool. There is also a fitness centre on-site. Bangkok Sky Restaurant serves breakfast, lunch and dinner while Baiyoke Floating Market hosts a Thai buffet. Ratchaprop Airport Link station is a five-minute walk from the property while Pratu Nam Market can be reached in ten minutes on foot. This accommodation is also known as Baiyoke, Baiyoke Hotel, Baiyoke Sky, and Baiyoke Sky Bangkok. Visitors say the property is centrally located and within a short distance of a number of attractions. The hotel also operates a free shuttle service stopping at some of these places of interests. Being the tallest hotel in Bangkok means there are plenty of great views for you to enjoy. Travellers explain that the observation deck is a great place to see everything in Bangkok. In addition to this, there are a number of rooftop eateries and bars that provide superb views as well. The hotel has a full service spa as well as a fitness centre for you to use. Guests point out that the number of facilities available is excellent and ensures you will never get bored. The property also boasts a golf centre and an outdoor swimming pool. There is complimentary Wi-Fi available in the rooms and common areas, but guests report that it can be difficult to use. The signal is not always available throughout the hotel and the speed of the Internet can be painfully slow. The entire property has a foul smell according to visitors who add that it is fairly unpleasant and nothing can really get rid of it. It was noted that the scent is prevalent in the accommodations as well as the hallways and even some of the common areas. Travellers state that the accommodations are starting to show some signs of age and overall the property looks a bit dated. The furnishings are not all that nice and the bathrooms have a lot of wear and tear.